As a huge fan of the IDOLISH7 franchise, I must say IDOLISH7 Vibrato was amazing. With a total of 8 episodes (According to MAL that doesn't seem to know how many episodes there are), as well as it being an exclusive Youtube Premium (At the time of the making of this review) show, it was a blast the whole way through. It may begin airing on TV, according to some rumors, but I don't know. Please note that I am incredibly bias towards IDOLISH7 because I've been a huge fan for a while. I'll cut the story some slack because IDOLISH7 Vibrato was created in a slice-of-life style. The first few episodes were basically dedicated to TRIGGER and how they got together. The last few episodes were dedicated to TRIGGER learning to be able to sing the "stolen" song from IDOLISH7 with a smile. These are really the only episodes that had a so called story, heck, I'd even refer to them as arcs. Everything in between, on the other hand, were styled like a slice-of-life, with not much story going on. The art is amazing! One of core aspects of an idol anime is usually the art. 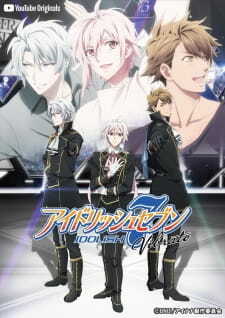 With idol anime like Bang Dream failing with the anime's art (at least the first season), but having an amazing game, I thought IDOLISH7 would be the same. But, so far, everything that has been adapted to anime and manga format seem to be awesome. I'm sure many people were attracted to the IDOLISH7 franchise because of the art and animation. The characters are extremely appealing. If you didn't like one character at the beginning, you most likely love them or show some kind of respect to them as a character. A notable character in Vibrato is the manager of TRIGGER, I somehow had a large hate for them, yet after watching the final episode of Vibrato, I somehow gained some respect towards them. With all of the characters having a unique personality, you'll somehow have a hate for another personality and a love for another, but IDOLISH7 somehow makes every character appealing to the viewer, regardless of their taste. Not only that, but with Vibrato, the studios takes it to another level of love. I really enjoyed IDOLISH7 Vibrato. It was a nice refresher from story based anime and provided a laugh here and there. But if you're a die-hard fan of IDOLISH7 like me, however, you'll most likely squeal at how adorable all the characters interactions are and such. I might as well warn you that if you're a die-hard fan of the characters, you have a chance of getting diabetes because of how adorable they all are. If this doesn't provide hype for the second season, I don't know what will. As you wait for IDOLISH7 2 to come, or even after IDOLISH7 2 comes out, you can watch this. It's really enjoyable to watch the characters interact and possible ships appear. I highly recommend this series for you to watch! What can I say, I love Idolish7 and especially the group known as Trigger. That's the only reason I needed to watch this and boy it's amazing. I wasn't sure if this was after the first season of Idolish7 ended or not. It turns out it is both. We get some stories about Trigger and their first meeting, as well as getting a good look at how things are for the groups now. The story didn't disappoint me, but then again, neither has anything associated with Idolish7 ever done. It lives up to my expectations and it's similar to the anime we know. This could as well be a part of a second season, that's how well made Vibrato was. The art was beautiful as always. We heard a lot of the songs from the anime Idolish7 and I love them. I was shown a new perspective of things after watching the first couple of episodes. The way people connect when they dance and sing is just beautiful and they sure show it as well. A lot of the characters from the original story took part in Vibrato. Trigger had a lot scenes for themselves, but we also got to see a lot of Idolish7. Overall I enjoyed this a lot and it was well made in every way. Even now, Trigger and Idolish7 still has as hard a time they had in the original story. It was a fantastic experience watching how Trigger grew and became one despite the many flaws they had to go through. That goes for Idolish7. If you're a fan of Idolish7 then this is most likely to keep you entertained like it did me. Thank you for making this a part of the Idolish7 anime!